This is a sponsored post on behalf of Schleich. Opinions are my own. Living on an acreage has given my boys many opportunities. Among them? We have had a large garden, flocks of poultry, cows, an orchard, and the chance to grow and raise our own food while learning how to work hard. But living on a farm doesn't have to be all work. In fact, one of the best things about it is the play! This year, we were dazzled by the Tractor with trailer ($59.99). The tractor features a real working door for the farmer to get in and out, and the trailer has collapsible sides and the ability to "dump". I was really impressed by how well the trailer hitch stayed in place, and the rubber tire of the tractor lets kids push it around on almost any surface! We also took the Hay Conveyor ($19.99) for a test drive. If you've never seen one of these in real life, you'll have to take my word for it that this toy replica looks and acts like the real deal. You can adjust it to any of 5 pitch settings, and the handle cranks manually to move the conveyor belt. Use it to put the hay into the wagon, just like on a real working farm! Finally, it would be Schleich without some animals to add to the mix, while I've seen some pretty neat ones in my local store lately (like a rattle snake!) most farmers don't want any more drama than what your typical sheep or chicken can provide. I laughed a little that this set came with a rooster. 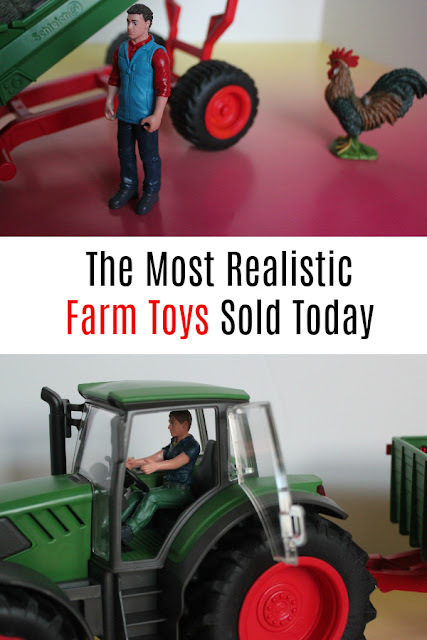 On our farm, we have more roosters than we should at this point, so I always find it amusing that Schleich adds one to their sets more often than not. (It just wouldn't be a farm without more roosters than you know what to do with!) The animal starter set is a modest $19.99 and a good way to get a feel for the quality of the products. For over 80 years, Schleich has been bringing the magic of the natural world to kids and collectors alike. I'm always impressed with the durability and art of these products. Just yesterday, my husband picked up one of the large hay rounds and said "Wow. It's actually molded. And heavy. I was thinking it wouldn't be that high quality." There you go. For farm-inspired toys that last, we choose Schleich every time. As life-long customers of the brand, I was happy to review these items and put them back in the box for under the tree. Get more info about Schleich's legacy at their website. You can also check the out on Facebook, Twitter, Pinterest, and Instagram! These trucks are so cool. I would've loved these as a kid.